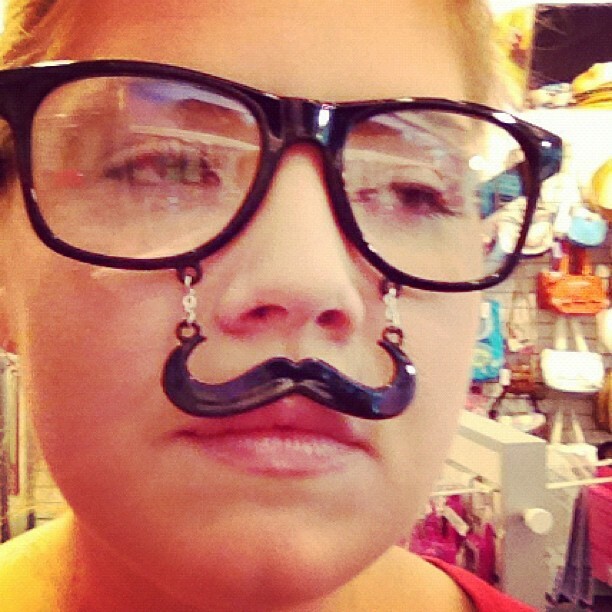 Previous postAugust ‘Stache Glasses Giveaway! Next postAre Your Parents Crazier Than Hers? Probably Not. Awesome corkscrew. Is this the last issue of Summer is Hot? Will there be a Fall is Temperate? These are always so fun to read. 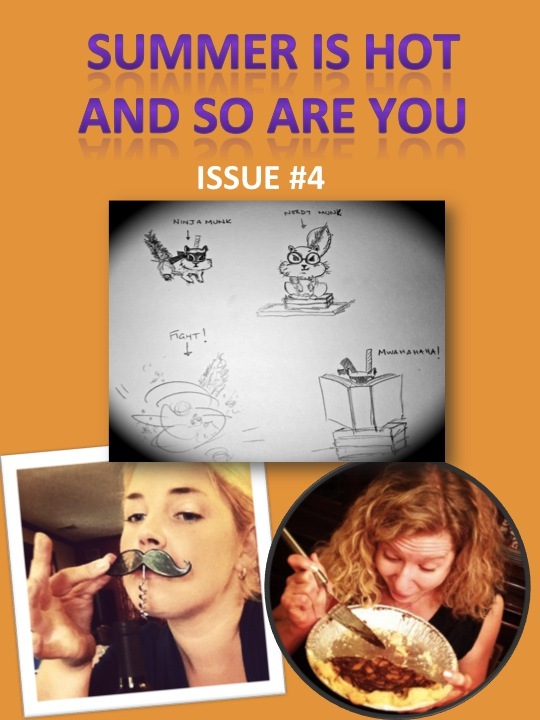 😀 The chipmunk drawing and the stache corkscrew…majorly cool. But seriously, why do people think you drink? It’s a mystery. Good question. I am currently pondering this over a pint [of vodka]. Sadly, she is WAY funnier than me. I would ban her from commenting, but much like with everyone’s ‘hotness,’ I feel her wit makes me look better by proxy. As does yours. And your flattery. Please keep it up. I was hoping you wouldn’t mind, Renee; it seemed like something that needed to be mentioned multiple times (also, you will do it justice)! And really, I’m sorry about your car. And your phone. And your computer. Are you sure you don’t drink? Because now might be the perfect time to start. I’ll open the wine. I’ll be there with my beaker filled with ginger ale. And lime. I can get totally sloppy on that. Okay Chipmunks. I just realized the cover said ‘Issue #3’ for the first hour it was up. This once again reinforces how nice (and hot) you people are. No one even pointed it out. You’re so cool. And I like your smile. It’s fixed now. I’m sorry. And the project manager in me is REALLY sorry. 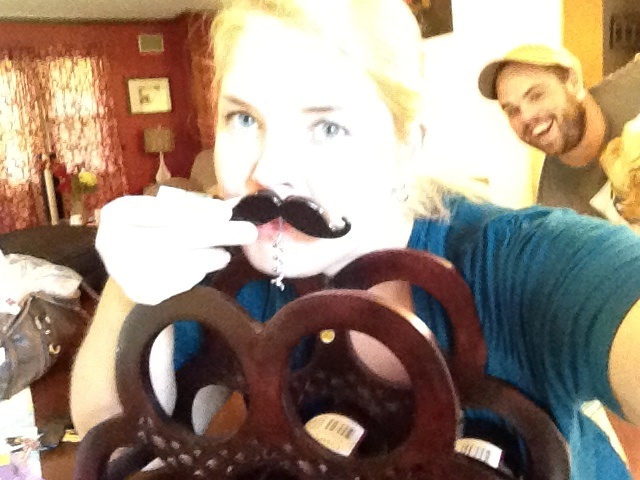 I saw that mustache wine bottle opener at Target recently, and of course thought of you. I was gonna get it and send it to you, but I thought, “I’m sure somebody has already sent that to her!” And I was right! With the measly amount of drinking you do, there is no reason you would ever need TWO of those. Phew! So glad I didn’t double your screwing pleasure. Nice Pep photobombing. Well done! Misty, if I ever need gift-giving advice, you’re the driving boss I’m calling! I’ll put on that red shirt right now. See you in a few. I love these… such wonderful little shout outs to awesome people! Thanks, Cassy! I’ve had a blast with these! I think I might have to take speaker7’s advice and do a “Fall is Temperate” series. That sounds good… with 100% more mustaches (Come on. That’s a good selling point). I put it to good use tonight. IF you know what I mean. After all, I know I’m drinking for three (you, me and the baby). The baby and I reeeeeeealllllly appreciate it! And THAT makes ME so happy to hear! I hope you’re not only putting it to good use, but also displaying it prominently, as I am. I LOVED Kate’s cartoons. She is one talented chipmunk. I’m applauding you for having any wine bottles in your wine rack at all. Well done. Right?! 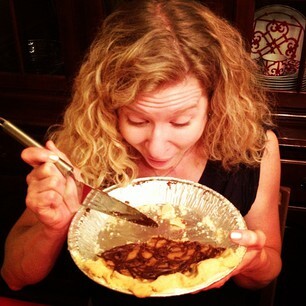 And she whipped that up in NO time (after I told her I wanted to feature the writing challenge)! hahaha Oh Rache. The only reason they’re there is because they’re both red, and I don’t drink red wine until I’m out of EVERYTHING else. Because, and ONLY because, it turns my mouth purple after only one glass. And the only thing I love more than my booze is my teeth. Only certain reds turn my teeth purple. If every red did, I’d have to resort to drinking with a straw. That’s how much I love red wine. I’m thinking you should continue the shout outs with “Awesome Autumn” as the title. Totally dig Kate’s blog, by the by. So glad you’re digging Kate’s blog, MJ! She’s great. I always meet the nicest people on the internets…I pretty much laugh at all your entries in the GJG & B-Man contests MJ, so v.glad you like my blog. Excellent. Be sure to give me complete credit every time you happen to comment on their blogs. In fact, you should probably just stay here and comment on all of my posts from the first three months I started blogging. They’re all really good. Except for the ones that aren’t at all. Hey…..I must be super awesome like you…cause mine are pretty darn good too…except for the ones that aren’t…..I think I should just take a day or two off work to read the entire internet and comment on everything….or I could just read all of yours….hmmm…. I wish you would stop introducing me to new, fab bloggers. I don’t WANT to read any more blogs. I already have no life because of the talented people on the interwebz. p.s. Tell Renee to stay the hell away from me. Apparently, near her is where machinery goes to die. I have no idea what you’re talking about. Because I only read one blog, and one blog only. Besides my own, which I read all the time. It’s called Arm-o-Margaret’s Succinct Summations. Or something like that. If there was a contest for who could break Renee’s spirit, I mean, car, I would win. I wonder what she thinks of that. Yeah, a few of my friends write blogs, although some write very irregularly. And a few of my relatives write food blogs. That is the best corkscrew of all time! Have you ever seen Wife Swap? …I’m just asking out of…curiosity. Nope, never heard of it. Never. Like especially not on Wednesday nights at 8:00. I think you need to start taking testosterone so you can finally have a real ‘stache. giiirrrllll. If I was ever on the fence about it, L, that would be the argument to push me over the testosterone edge. Imagine the versatility you’d have with a beard and lady styling products. Beard corn rows? Beard braids, Quadruple curly moustache. Beard Perm. My wine rack has one bottle on it. 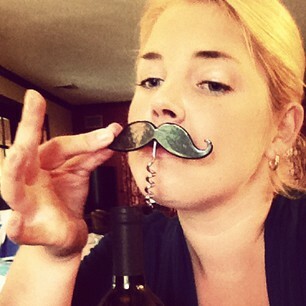 I’ll bring the ‘stache wine opener. Be there in five. But what are you going to drink? This one had a cow on the label. Also jealous you got a shout-out from Tech. Glad to discover Kate. Thanks! Also, what do you use to edit your photos? Picmonkey? Something else? Nina, a credible source recently confirmed for me that 3-way calling is still a thing! If you catch my drift. I am officially a total Instagram junkie, and take all of my pictures on my iPhone because I don’t have a ‘real’ camera of any kind. Sometimes I’ll adjust the color/exposure, etc. in iPhoto or the ‘Preview’ application on my laptop. P.S. – Oh and when I do anything with ‘talky bubbles’ or any special effects, I use PowerPoint (I don’t have PhotoShop). teehee…loved your hubby’s photo bomb! Thanks, D-Pants! He’s pretty proud of himself for that one. he’s too cute! Something Jim would’ve done for sure. You words ads seems to think I’m very excited to do something connected with someone named Mondo Guerra. Maybe I am, Word Ads! Maybe I am! Anyway – “Internal battery never dies”: very nice. I really appreciate that the WordPress overlords are getting in on the fun here. And I hear Mondo really knows his way around a webcam. Thank you. That’s nice of you to say, especially since I wasn’t fishing for compliments in any way whatsoever.